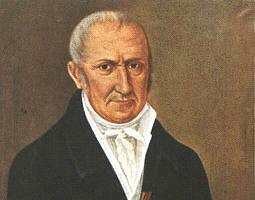 Not far from Bologna, in Pavia, Alessandro Volta was professor of science. Volta had considerable experience with static electricity (in 1775 he introduced an improved version of the "electrophorus", to be discussed in a later section). Volta suggested that Galvani's electricity was not of biological origin but arose from the contact between metal and wet, salty material such as organic tissue . The phenomenon is much better understood now, through the theory of the ionic bond which binds together certain molecules. Suppose we dip a plate of zinc into a glass container holding dilute hydrochloric acid, so that the top of the plate, held by an insulating cover, sticks out. The acid will dissolve some of the zinc, and will now contain not just H+ ions and Cl- ions but also doubly charged zinc ions Zn2++. The plate is slightly negative compared to the solution because of the electrons left behind, but the zinc ions cannot wander far, being held by that negative charge. The end result is that some of the zinc ends up as zinc chloride, replacing hydrogen which bubbles up, and that an electric current flows in the wire from the copper to the zinc--the copper being electrically positive ("anode") relative to the zinc ("cathode"). Compared to static electricity, which easily can reach hundreds and thousands of volts and create visible sparks (though the charge itself is small), cells typically produce about one volt, though they give a continuous flow of electric charge ("electric current"). Volta in 1800 connected a large number of cells with the (+) side of one connected by wire to the (–) side of the other, so the voltage across this entire "voltaic pile" was the sum of the contributions of all its cells. . This was the first electric battery, and was used extensively in electric experiments. It was quickly found that when electric currents from a battery are led through an ionic solution ("electrolyte"), they can produce "electrolysis", a breakdown of the chemical compound in liquid solution. Drive a current between two electrodes dipping into a solution of table salt NaCl in water: the current will split the salt ions Na+ and Cl– apart. However the experiment will not yield either sodium or chlorine. Instead the products react with the water in solution, and what comes out are hydrogen and oxygen gases, the result of splitting up the H2O molecule of water, while the sodium and chlorine recombine. In many cases, the circuit is not clear--some have claimed that small variations in composition have a role, also contact with the ground. Rusting is certainly more pronounced in the presence of salt water--which is why the US navy has anchored reserve ships in river estuaries, and why ships on the Great Lakes of the US tend to outlast those of the ocean. Salt spray on bridges etc. next to seawater also enhances corrosion. Stainless steel contains nickel and resists rusting by forming a tough oxide layer where it contacts the air, and aluminum resists corrosion is a similar way. Because metal corrodes, in the era of sailing, wooden hulls of ships were not joined by nails, which rust, but by wooden pegs or "trunnels" ("tree nails"). The effect is much more pronounced where two different metals come in contact. One popular way of protecting iron is by galvanizing it--dipping it in molten zinc to give it a zinc coating. A scratch in the coating will promote corrosion--but it is the more reactive zinc coating which wears away, while the iron stays protected (since the two metals have similar color, many users hardly notice the corrosion,). Only after most of the zinc is worn off does rusting suddenly accelerate. Similarly, home water heaters contain "sacrificial electrodes" of zinc (not connected to any source of electricity!) to draw corrosion away from vulnerable metal parts. The Statue of Liberty in New York's harbor was assembled from carefully shaped sheets of copper, held in place by an iron tower. The plates were held by iron brackets, and though paint was used to separate iron from copper, over the century during which the statue has stood on Liberty Island in New York's harbor, the paint wore off and contact between iron and copper began. Luckily, copper is the less reactive of the two, so when the statue was renovated, heavily rusted iron brackets could be replaced (and insulated), while the original copper, though covered with soft green patina, was intact.